Paul Cook believes Pompey will cope with the loss of Gary Roberts. The talismanic Blues midfielder has been playing through the pain barrier in recent weeks but Cook decided enough was enough when the 31-year-old needed an injection ahead of the home clash with Mansfield. Although the former Chesterfield man was keen to make himself available, the Pompey boss is looking at the bigger picture and wants him back to full fitness, rather than dealing with the ongoing problem. And Cook is now expected to turn to Conor Chaplin or Kal Naismith to fill the void. 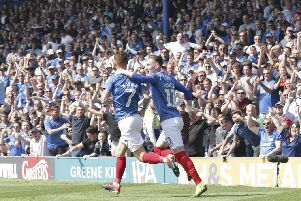 The Pompey boss said: ‘I’ve made up my mind about what we are going to do but we’ll keep that one to ourselves for the time being. For Roberts, it’s a frustrating interruption but Cook thinks a couple of weeks out could make all the difference on his return to the side. Cook said: ‘What you’ve got is a lad who is trying too hard to do well. ‘But he is not fit. He’s been missing training and then turning up on a Saturday and carrying the mantle of being “Gary Roberts: the best player in the league”. ‘But he’s not playing well. ‘And when you are not playing well, you are not the best player in the league are you? ‘So you think you are picking a good player but the reality of it is, he’s not because he’s not match fit and he’s not doing himself justice. ‘We’ve got a squad of players to play football and we want Gary Roberts to get back fit properly, come back into the team and give us a lift. Since seeing Roberts pick up the injury in the win over Barnet, Cook admits he has become concerned there has been little improvement. ‘It got to the point where he needed an injection this week and that shouldn’t be happening,’ said the manager. ‘Since Barnet, the ankle is now getting worse. ‘It’s swelling up, it’s not getting better and it’s having an effect on him. ‘He is not training from game to game. Cook believes he still has enough quality to register an overdue home win. And he backed his side to recover from the body blow of the late equaliser in midweek. He said: ‘The lads were very flat after the game against Stevenage. ‘But that’s what happens when you a concede a goal in stoppage-time. ‘I didn’t feel they ever looked like scoring and then we had the hammer blow at the end. ‘People forget our fans left the stadium euphoric when we scored in injury-time and drew 3-3 with Morecambe. It was the same outcome.